Russian President Vladimir Putin wants to host an Israeli-Palestinian summit to revive peace talks, Egyptian President Abdel Fattah el-Sisi said in an interview published on Monday. Sisi also told state newspaper editors that he believed Israel was increasingly convinced of the need for a peace deal, saying it was a "positive sign". But Palestinian infighting between Hamas in Gaza and Palestinian President Mahmoud Abbas's Fatah in the West Bank remained an obstacle, he added. Talks between Israeli Prime Minister Benjamin Netanyahu and Abbas have been suspended since 2014, despite a push by Washington and France to resume the peace process. Sisi, who is seen as having good ties with both Israel and the Fatah-dominated Palestinian Authority, has also been pushing for a resumption of negotiations. 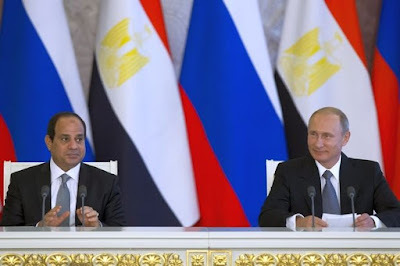 "Putin has told me that he is ready to receive both [Abbas] and Netanyahu in Moscow to carry out direct talks to find a solution and solve the issue," Sisi said.